Gigantor and friend just sat there like they owned the place. This was news to share with the family. It was a Sunday afternoon, so I ran to get Clay and my wife to take a look. Of course, by the time we got back outside they were gone. But my wife did confirm an earlier sighting of these monsters, so I know I didn’t imagine the whole adventure. 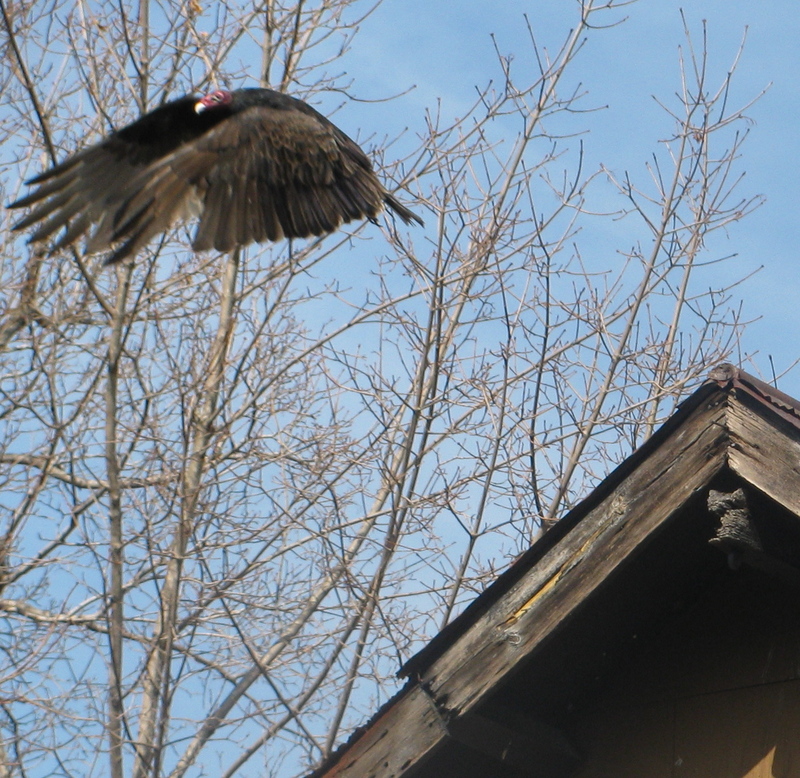 A quick search on Google revealed that we have two vultures nesting in the loft in our garage, and they are not going anywhere until mating season is over in May. One has a red head and one has a grey head, prompting much discussion over whether they are black or turkey vultures. Either we are hosting the first interracial vulture couple in existence or one of them is younger and hasn’t fully matured into its red face. We’re going with turkey vultures. They’re not causing any trouble so far, but the afternoon sitter isn’t overly thrilled, since they seem to spend late afternoons lurking in the tree branches like they are waiting for a hanging. They mostly feed on carrion (dead animals), so I think she is OK as long as she doesn’t lay down on the ground or walk around with cold cuts on her head. The dog doesn’t seem too worried, and, frankly, he seems the closest to their food group, so I’m taking my lead from him. Still, this called for advice from an expert. We turned to our resident animal lover, Clay, who has been taking the new visitors in stride. 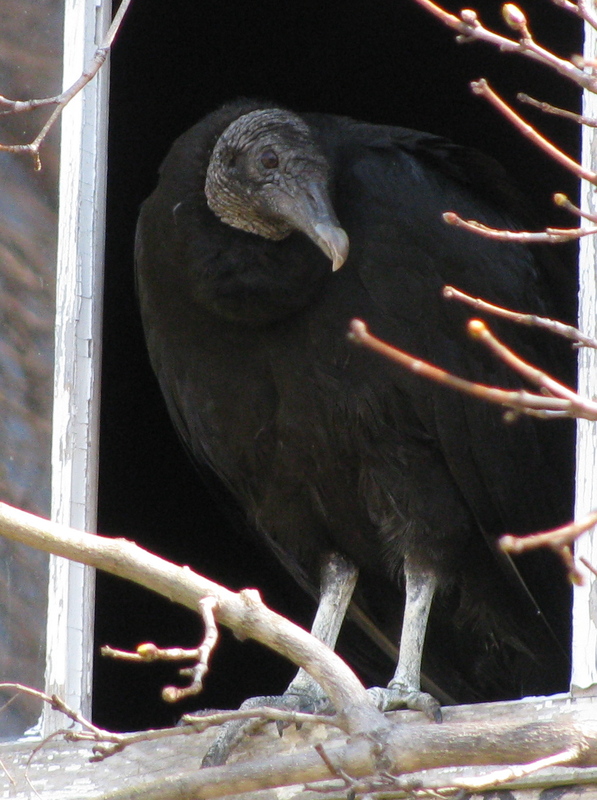 “Do you like the turkey vultures,” my wife asked on the keyboard he uses to communicate. There you have it. I’m bringing the little guy out with me when I barbecue, though. Just in case. This entry was posted on April 7, 2011, 8:40 am and is filed under Communicating, Daily Life. You can follow any responses to this entry through RSS 2.0. You can leave a response, or trackback from your own site. He’s so in tune with the world around him — I think the world is a better place for having him share his insights with us. Thank you! Also, I think you guys should name your vulture couple! Great idea. Any naming suggestions out there? Hi Larry – Lovely vultures… great kid…keep those cold cuts in the house, though! I was honored to meet Clay last summer when he came out with Roe to ride my big horse ‘Morgana’. He has a keen insight on nature and animals. 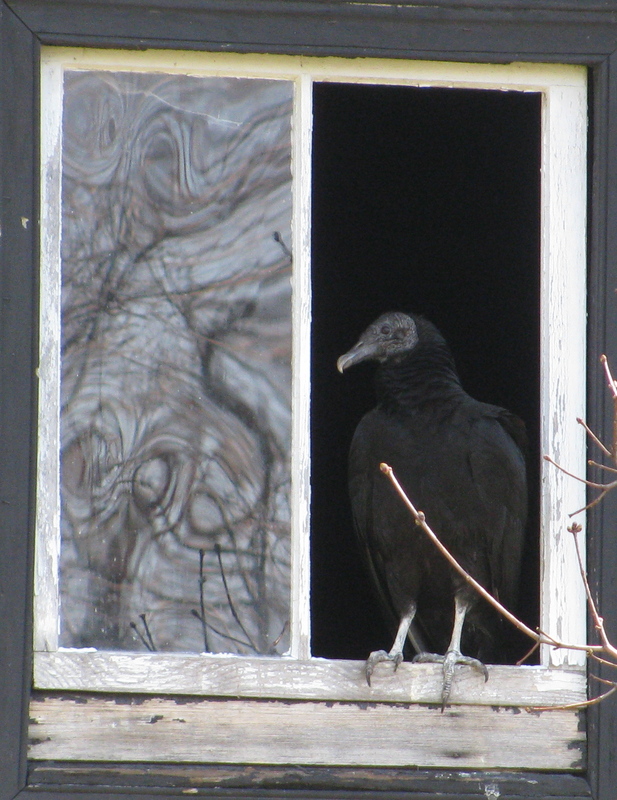 I am greatful for Turkey Vultures. They really are Gods garbage men. They keep down viruses and bacterial by cleaning up road kill/dead deer etc.. Enjoy these critters. I told Roe that you have a flare for writing. Lord knows, you have enough material for a book. BRB while I go look up the word “docile”! =) He sounds like a great kid!! !